According to Roger Oyler, Program Lead for the Wild Horse and Burro Program in Arizona, the biggest problem for Arizona's wild horses is harsh desert conditions. The biggest concentration of the state's wild horses is in the southwestern corner of Arizona in the Sonora Desert, which gets an average of only 4 inches of rainfall per year. However wild horses also inhabit the northwest corner of the state in the Mohave Desert, which is only a bit more water-rich, receiving an average of 9 inches of rainfall per year. The Arizona deserts are the hottest deserts in the United States. The state's southern deserts may top 116 degrees Fahrenheit in peak summer months. Horses in southern Arizona, lacking ample prarie grass, nibble on tree leaves and other plants. According to Oyler, the Colorado River supports Arizona’s wild horses in the southwest, while horses in the northwest get their water through wells and natural springs that are scattered throughout the area. Coyotes and mountain lions are among the largest desert predators; however they pose a minimal threat to wild adult horses. Foals can be in danger if a hungry coyote or mountain lion is lurking, but Oyler says these predators usually leave horses alone. However, a drop in the state's northern wild horse population has him speculating whether coyotes and mountain lions may be responsible. Rattlesnakes and scorpions are venomous desert predators, but they are of little danger to horses. A rattlesnake's venom is rarely fatal to a horse if treated, and the only reason a rattlesnake should strike an equine is out of defense. Snakes aren’t looking to make dinner out of an animal that much bigger than they. Oyler says a scorpion's sting, to an equine, is the equivalent of a bee sting to humans. A scorpion's bite will hurt a horse, but it won't kill one. 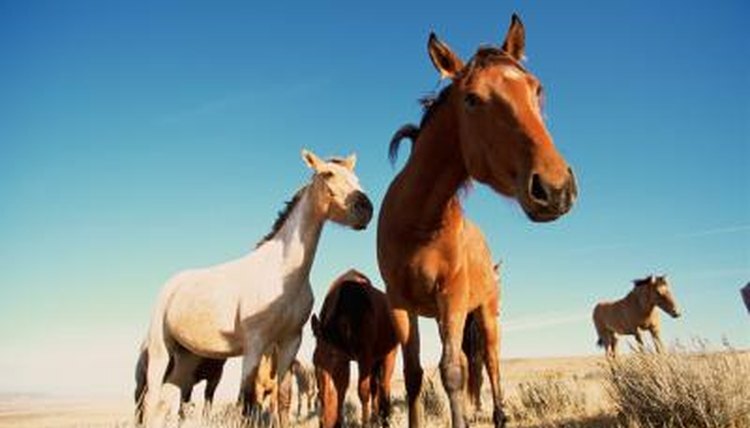 Humans pose minimal threat to Arizona’s wild horse population. In fact, people are a big part in keeping the horses safe. The Wild Free Roaming Horse and Burro Act of 1971 ensures all unclaimed horses and burros on public land are protected through the United States Forest Service and the Bureau of Land Management. The act says these agencies are responsible for maintaining healthy herds and habitats. When the herd of wild horses becomes too great for the habitat to sustain, some of the animals are rounded up and offered for adoption to U.S. citizens. Historical information doesn't illuminate how wild horses wound up in Arizona, but Oyler says it is believed that, after the equines arrived in the southwestern United States with Spanish explorers in the 1600s, some horses may have escaped from European explorers. Another belief is that they are the progeny of horses that miners brought to the area during the state's gold booms in the late 1800s and early 1900s. This is mostly likely when people left horses to fend for themselves. What American State Doesn't Have Poisonous Snakes?